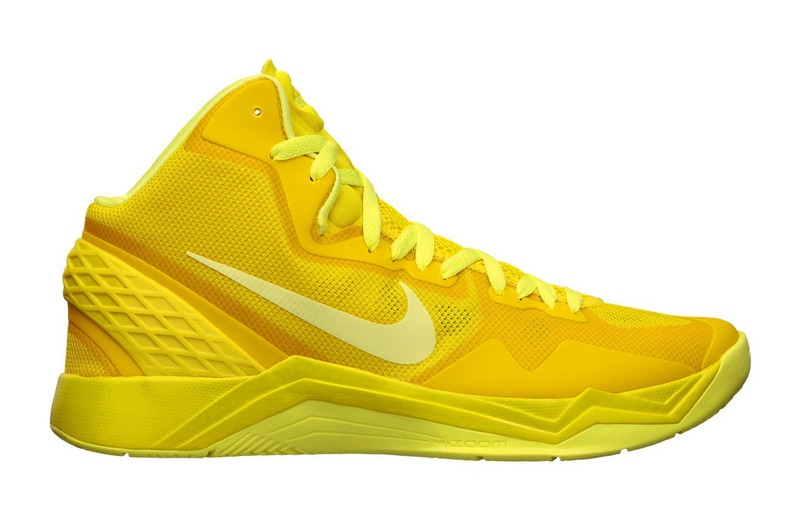 The new Zoom Hyperdisruptor from Nike Basketball is now available in a very yellow colorway. The new Zoom Hyperdisruptor from Nike Basketball arrives in a very yellow colorway with this version in 'Vivid Sulfur/Electric Yellow'. One of Nike basketball's newest models, the Zoom Hyperdisruptor features a one piece upper and less rubber at the outsole for aggressive traction and lightweight, low to the ground feel. The shoe also utilizes, according to Nike, the biggest Zoom Air units in both the heel and forefoot ever in a Nike Basketball shoe. This vibrant 'Vivid Sulfur/Electric Yellow" colorway, along with black and grey versions of the Zoom Hyperdisruptor are available now online at Nike Store.